As an antidote to hot weather, a chilled bottle of something refreshing to splash on is a must. Open my refrigerator, and among the salted anchovies, ancient miso, and quart of half and half you’ll find a plastic jug of Revlon Jean Naté. If I could swing it, you’d see a clutch of Pierre Cardin Choc de Cardin bottles instead. Choc de Cardin, developed by perfumer Françoise Caron, launched in 1981.1 It’s that rare fragrance that’s a mix of refreshingly clean and scintillatingly dirty. To get an idea of what I mean, imagine the scent of a hot sidewalk after a rain. No, Choc de Cardin doesn’t smell like wet cement, but it blends the sensation of dirt and crisp clean. Or think of what it’s like to emerge from the shower, all soapy fresh, then slip on your honey’s bathrobe — the robe that should have gone in last week’s wash but didn’t. That’s what I mean. Choc de Cardin opens with sharp, soapy green. Initially it smells like many bergamot and herb-tinged colognes, cool and refreshing and not overly citrus. Before long, skank kicks in in the form of coriander and civet. Clean, light florals that smell to me of lily of the valley and maybe ylang ylang soften the earthy, woody skank, but you’d never know they were there unless you smelled for them. Sandalwood and oakmoss cushion the otherwise austere fragrance, transforming it into an herbal-floral chypre. Choc de Cardin is an oddball. Most fragrances touched with skank seem to be warm and thick. Think of Rochas Femme, Amouage Jubilation 25, and Jean Desprez Bal à Versailles, for example. By contrast, Choc de Cardin is dry and sheer — cold, almost. But dirty. And clean. It’s such a pleasure to sample a fragrance that doesn’t cleave to trend or convention. On my skin, Choc de Cardin Eau de Parfum only lasts about four hours, and at that point it takes nose-to-wrist contact to appreciate it. (Yet another reason it would be the perfect summer chiller fragrance.) 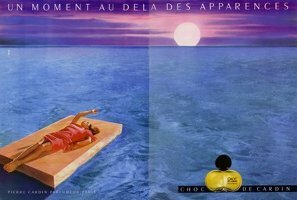 Choc de Cardin is marketed as a woman’s fragrance, but it's firmly unisex. Unfortunately, Choc de Cardin has been discontinued, although bottles of Eau de Parfum and (rarer) Eau Tonique are still available here and there online. It looks like for scorching days I’ll be sticking with my refrigerated Jean Naté supplemented with Rochas Eau de Rochas. Unless, of course, you can recommend any other sheer, fresh-skanky fragrances for summer. 1. In reviews on the internet I’ve seen references to Luca Turin saying Choc de Cardin is one of Caron’s lost masterpieces, but I’ll be darned if I can find the original quote. Thank you! I sat with the Guide in my lap and thought about attempting some sort of scan for “Francoise Caron,” but gave it up. Thank you for finding it! Blast! If I’d noticed this earlier, I would have been able to save you the trouble of looking around for the LT review. I have a near photographic memory of the LT/TS Guide, for some reason, so please feel free to ask if you’re looking for something else. Love this one, and nobody ever mentions it, so I’m gald to see it get a lovely review. Does sort of remind me of Eau de Rochas, which is another favorite. Do you get mango? I get weird tropical fruits. Somebody once mentioned they thought it was like Knize Sec, but I didn’t really get that. Maybe I should try them side-by-side. You are truly a woman of many skills! I love Eau de Rochas, and I tried it side by side with Choc because I had the same thought you did, that they’re similar. To me, Eau de Rochas is equally sheer and refreshing, but less green and more sweet. It’s more lemony to me. Since I only have a sample–and barely any of that, now–of Choc, Eau de Rochas will probably continue to be my go-to summer fresher for when I can’t bear Jean Nate’s plastic top notes. Hey, I should send you some Choc! I have two splash bottles. I think one is a little on the turned side in the first minute or so of the top notes – hey, great sales job I’m doing! – but otherwise beautiful. Choc seems very “you” to me – chic and self-sufficient, and while classic in style, still plenty of quirky little touches. Oh my gosh! How I’d love to live up to that description! Really? I see your comment is form years ago but one never knows… I’ve been looking around for a while now since my last drop of my last bottle is gone and Choc is really my signature scent. Would you be interested in buying if you still have a spare bottle? This sounds pretty terrific for someone like me who doesn’t much care for traditional citrus scents but often likes weirdo oddballs. It’s a shame that it’s been discontinued since I operate a strict No Unsniffed Purchases, No exceptions rule. Skanky cologne brings to mind Eau d’Hermes, any thoughts on how the two compare? I get the feeling that this is lighter somehow? As for sheer, fresh-skanky scents, isn’t that what sweaty grapefruits like AA Pamplelune and OJ Osmanthus are for? You’re right, Eau d’Hermes, even though it’s called “Eau,” feels much thicker, less sheer to me. AA Pamplelune is dirty, but more cat pee than unwashed body to me (doesn’t that sound appetizing?). I’ll have to get out my sample of Osmanthus. It’s been far too long since I’ve tried it, thanks for the recommendation. And congratulations on your self-restraint! I wish you could send a little of that willpower to me, and I’ll apply it straight to my lust for mac and cheese. Thanks, Angela! I find that most fragrances with realistic grapefruit notes smell of unwashed body to me which is why I can never bring myself to wear them especially in the hot weather. You’re in good company, believe me! Great review as always, Angela! I actually received a bottle of this in a swap last summer. I thought I was swapping for the long discontinued Pierre Cardin for women, which was a tall bottle w/a silver U shaped cap. PC was my scent back in my partying heyday, circa 1982. Instead, it was a bottle of Choc that came my way. Disappointment has kept me from giving much sampling time to Choc; have to give it a better tryout esp as I love Eau de Rochas. Etro Shaal Nur comes to mind as a dry and fresh, but it’s too heavy for what you’re looking for, I think. I love Shaal Nur! I’m sure I’ll buy a bottle of it someday–thank you for reminding me of it. Enjoy the Choc! If you don’t like it, you know where to find me. I’m sure we can work out some kind of deal…. Hopefully you’ll find that you love Choc! You might like Heeley Cedre Blanc for a fresh/dirty combo. I know many have problems with its longevity, but it lasts about three hours for me. I hit the enter button too soon. Cedre Blanc is like a sheer cologne version of Bois de Violette. For a refreshing type of fragrance, I really don’t mind if it’s fleeting. That’s kind of the point, in some ways. Thanks for the suggestion! Oh Angela … your reviews sound like a Nat King Cole song. I do love Nat King Cole. His voice is pure silk. Now, if I could get reviews to hint at Cole Porter, that would be even better! I think that a fresh skanky scent is the only way I would like a fresh scent. I’m going to have to try a few that we’re mentioned. NST commenters are always great for suggestions, I find. Lucky for me and the rest of us! Actually, I want a fragrance that smells like a hot sidewalk after rain. Ideas, anyone? Maybe you’ll have to have Christopher Brosius make you one! I was thinking the same thing after reading Angela’s description! I’m going to have to get thinking on this one…. After a few hours thought and a test spritz on the back of my hand, I’m going to go with Molyneux Quartz as a candidate for hot, wet sidewalk. Just imagine a flower garden up the street at the same time. how about mugler cologne? clean lemony scent and yet quite dirty and personal after a few hours of wear. delicious! I love Mugler’s cologne! I spray my bed and pillows with it when I change my sheets. Angela, how do you come up with all these fabulous discontinued fragrances that I must immediately hunt down and buy? I need to create a line item in my fragrance budget for purchases that are directly inspired by your reviews. Since you led me to Eau de Rochas, I implicitly trust any fresh-and-clean scent that you recommend. This one I received a sample of in a swap. I’m glad you like Eau de Rochas! At least it’s easier to get your hands on. Choc is still widely available and cheap in France – they sell it at the mega-supermarkets that have shopping centres attached. The last one I bought a couple years ago came in the bottle shown in the ad, although I’ve seen vintage ones in different taller bottles online (admittedly years ago). I’m sure mine is sort of reformulation, but it smells like a cross between Quadrille and Mitsouko to me, sort of a slightly soapy peachy spicy chypre, light bodies but still unmistakably a real smelling chypre. Adding Pierre Cardin in France seems to occupy ‘cheap scent’ shelf space in French supermarkets alongside Celine Dion perfumes and huge 500ml-litre bottles of 5 euro cologne (which doesn’t smell nice in case anyone is wondering). I’m sure I picked up about 75 or 100ml of Choc for definitely less than 30 euros. Adding again, while I remember, VC&A Gem is still sold in French perfumeries, in a gold refillable 90ml cannister. It’s been reformulated but I actually prefer the reformulation – the original was actually too powerfully skanky for me to wear. It’s still a pretty strong real chypre though, worth grabbing if you see it. Hey, that’s good news! I’m not sure when the next time I’ll be at a mega supermarket in France is, but you can be sure if I do I’ll look for Choc. Thanks Angela for a lovely review of an old favourite of mine. I had a bottle back in 1982 when I was a student and before I could afford Chanel Cristalle which was what I also loved then. I’m going to look out for another bottle when I go to France in the Summer. I hope you find one. It would be interesting to see what you think of it now, and if it brings back memories.